Temperature: 5,000°C – 6,000°C State: Solid Composition: Iron and nickel The Earth’s inner core is a huge metal ball, 2,500 km wide. Made mainly of iron, the temperature of the ball is 5,000°C to 6,000°C – that’s up to 6,000 times hotter than our atmosphere and scorching enough to make metal melt! The metal at the inner core stays solid because of the incredible pressure surrounding it. Temperature: 3,000°C State: solid Composition: Iron, oxygen, silicon, magnesium and aluminium. 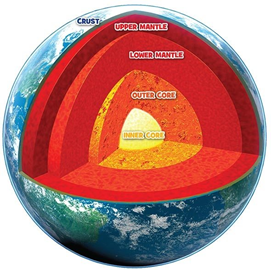 The lower mantle is found between 670km and 2,890km below the surface, and is made from solid rock. The rock is hot enough to melt, but is solid because of the pressure pushing down on it. Temperature: 1,400°C – 3,000°C State: liquid / solid Composition: iron, oxygen, silicon, magnesium and aluminium This layer is up to 670km below the Earth’s surface. The lower part of the upper mantle is made from both solid and melted rock (liquid), while the rock in the upper region is stiffer, because it’s cooler. Temperature: Around 22°C State: Solid Composition: Oceanic crust made up of iron, oxygen, silicon, magnesium and aluminium. Continental crust made up of granite, sedimentary rocks and metamorphic rocks.